The Supreme Court’s recent decision in Burwell v. Hobby Lobby invokes passionate debates and fiery discourse. At the spearhead of exchange are questions about reproductive, First Amendment, and healthcare rights. 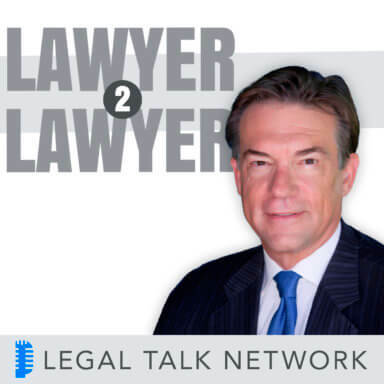 On this episode of Lawyer 2 Lawyer, host Bob Ambrogi brings light to these issues along with Emily Martin from the National Women’s Law Center and Elizabeth Slattery from the Heritage Foundation. Together they discuss the application of the Religious Freedom Restoration Act vs. invoking a Constitutional argument centered around the First Amendment. Tune in to learn more about the 4 debated methods of contraception, Justice Ginsburg’s dissent, and religious rights of corporations. Emily Martin is the Vice President and General Counsel at the National Women’s Law Center, where she undertakes cross-cutting projects addressing women’s health, economic security, and education and employment opportunities. Prior to joining the Center, Ms. Martin served as Deputy Director of the Women’s Rights Project at the American Civil Liberties Union and served as a law clerk for Senior Judge Wilfred Feinberg of the U.S. Court of Appeals for the Second Circuit and Judge T.S. Ellis, III, of the Eastern District of Virginia. She has served as Vice President and President of the Fair Housing Justice Center, a non-profit organization in New York City. Elizabeth Slattery is a senior legal policy analyst in The Heritage Foundation’s Edwin Meese III Center for Legal and Judicial Studies. She researches a variety of issues such as the rule of law, the First Amendment, civil rights and equal protection, and the scope of constitutional provisions. Ms. Slattery also studies and writes about cases before the Supreme Court, judicial nominations, and the proper role of the courts. She manages the Meese Center’s appellate advocacy programs, including moot court sessions to prepare litigators for oral argument before the Supreme Court. Ms. Slattery’s analysis and commentary have appeared in The Washington Times and The Washington Examiner, as well as outlets including National Review Online, The Daily Signal, The Daily Caller and U.S. News & World Report.